Jen sang at two charity gigs and she enjoyed it. She's started a new book about the Rocky Flats nuclear plant called Full Body Burden. She and Ron have been watching cheesy horror films, because it's October, including Carnival of Souls. She took a drop spindling class at CogKnitive, and she loved it. She's also working on her 30 Day Sweater out of Dizzy Blonde Superwash DK in the color Anna. She spent a lot of time working on cable charting. She also worked on her Rocky Coast Cardigan out of Fibre Company Organik in Highlands. Melissa knit a huge Mountain Ash Shawl and it killed her will to knit shawls, so she is working on Leah's Lovely Cardigan (her first sweater) from More Last-Minute Knitted Gifts out of Malabrigo Sock in Archangel. She is also working on a lot of hats for Hatoween (with some help from Jen). Laura finished one pair of Tree of Life Mittens in the Forest Heather color of Knitpicks Wool of the Andes, two Olivia's Butterfly Hats for Halos of Hope out of Knitpicks Brava, and she finished her Mother Bears (faces and all). But really, Barbara from 2 Knit Lit Chicks did the faces. 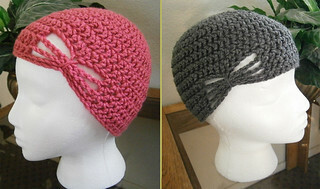 Jen will be jumping into crochet, making a Basic Stitches Crochet Hat for the Throwdown. Also other throwdown hats. She will be making a little sweater for her nephew's first birthday out of Delicious Yarn from Stitch Cafe. We answer a question from MillieHanS. 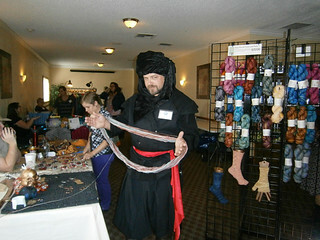 Any tricks, tips for knitting with two yarns - not necessarily together. Say one is a wool that can be blocked as for a lace edge but the ‘body’ of a rectangular shawl isn’t as stretchy. I can’t figure out a good way to determine repeats so they are the same width even tho I swatch. Swatch. A lot. Wash and block the swatches. Swatch them together. Or find two yarns that are more similar if you can, because that might be more easy. 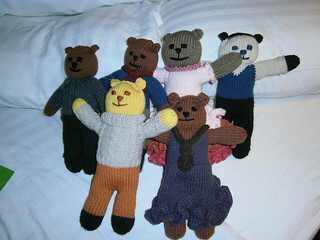 Also consider if you're picking up stitches, changing yarns, knitting on a border--they will all change how it behaves. A lifeline might be your best friend. Also don't be afraid to re-do things. Jen and Melissa bought some great yarn at CogKnitive retreat including Forbidden Woolery, Knitted Wit yarn, bags from RKs Mom and Slipped Stitch Studios. Melissa bought a lot of Dizzy Blonde Yarn. And a lot of her yarn was pink. Jen and Melissa both bought some Indigo Dragonfly yarn and they love her color names. There were some great metal shawl pins. Jen got some great Bee Mice Elf fiber for spinning and wants to get some Red Fish Dye Works fiber when she's a better spinner.